We are a company dedicated to creating graphic solutions, multimedia, and web design. committed to developing first class services and keep our customers satisfied with the service provided. We intend to provide our customers the best experience from beginning to end, developing smart websites, designing a corporate image, creating interactive videos for their business with fast and great quality. Arcos Multimedia Group that was founded 2009 in Austin, Texas, USA by Luis A. Ameglio Diaz..
is a widely-used open source general-purpose scripting language that is especially suited for web development and can be embedded into HTML. Web design include web graphic design; interface design; authoring, including standardized; user experience design; and search engine optimization. The Client: This is one of our non-profit sites. Ask about our special non-profit prices. The Web: We used WordPress for the construction of this site. The Client: Attorney Erica Davis is the managing attorney at The Davis Law Firm. She practices primarily criminal defense. The Client: Creative Printing of Austin is a screen printing website. You can customize your shirts online, order them, and have them ready within two days. The Client: The Biz Booster Aerial Photography Services offers affordable, high resolution, drone aerial photography and video. The Client: Raul Garcia with his late father doubling as his legal assistant, opened up his own practice in Austin and McAllen. In 2011, Raul and his brother Carlos formed García & García Attorneys at Law, P.L.L.C. Under Raul’s guidance, the offices continue to grow. In addition, Raul recently oversaw the expansion of a third office in San Antonio. The Web: We used Joomla for the construction of this site. The Client: RR Tabernaculo is a Christian Church pastored by Andres Martinez and his wife. Located in Austin, Texas. The Web: We used WordPress for this site. The Web: We use WordPress for the construction of the site. The Client: Affordable Tree Service takes care of all your tree needs. Committed to give your trees the care they need to increase their life and beauty. Located in Austin, Texas. The Web: We use Concrete5 for the construction of the site. The Client: AJ Tree Services is a professional tree service providing Arboriculture Services in Austin, Texas. The Web: We use Joomla 3.0 for the construction of the site. The Client: Little Hands International Preschool, is the only preschool in Round Rock, (right outside Austin’s city limits) offering multiple immersion language classes in Mandarin Chinese, English and Spanish. The Web: We use Joomla 3.0 as the engine for the construction of the site. The Client: The Law Office of Ayala & Acosta is a law firm providing representation in the areas of Immigration Law and Criminal Defense. Located in McAllen, Texas. The Web: We use Joomla 3.0 as the engine of the construction of the site. The Client: Attorney Iris Albizu offers highly skilled counsel on all issues related to federal immigration for clients throughout the United States. Located in Austin, Texas. The Web: We use Concrete5 as the engine for the construction of the site. 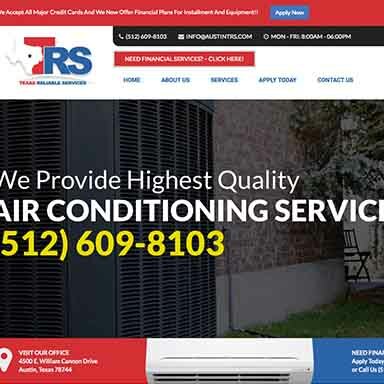 The Client: Austin Texas Reliable Services is a company located in Austin, Texas. Covering all Air Conditioning, Heating Repairs, Installation and Preventative Maintenance. The Web: We use WordPress as the engine for the construction of the site. The Client: Xtra Maid is a Residential and Commercial Cleaning Company located in Austin, Texas. The Web: We use Joomla 3.0 as the engine for the construction of the site, the web site comes with a full secure application for credit card services. The Client: La Bodega Gourmet is a small piece of Spain located in Austin, Texas. Offers a different culinary experience bringing to the area an exotic taste of Paella. The Web: We use Joomla 3.0 as the engine for the construction of the site, we also merge the old site Paella Mix with the new design. The Client: One Stop Cleaning Services is a company located in Austin, Texas offering cleaning services for Residential and Commercial. The Client: Skyline Erectors is a company dedicated to provide value-added construction services. Located in Dale , Texas. The Client: Genesis Electrical Services is a company located in Austin, Texas dedicated to offer electrical services. The Web: We use Joomla 3.0 as the engine for the construction of the web site. We are a team of Branding, Marketing, Web Design, UI/UX, Web Developers and Graphic Design experts. Joshua is located in Dubai, UE. He is in charge of all projects in Middle East & Europe. Catch up on our latest articles about Web Design, SEO, Business Motivation and much more. Excellent work, love our logo for Genesis Electric, very unique, just what we expected! Thank you arcos multimedia! I'm very happy with the service I received. The website looks great! Thank you so much. Arcos Multimedia Group ©2009 - All Rights Reserved.